Since we are aware of the importance of carrying the load of your equipment when walking to the flying site. Windtech introduces a new "Comfort Bag". This new backpack has a sophisticated design with many great features. It has a large capacity and has the best weight distribution for maximum comfort. The new materials make wariness much longer and stronger on the long run and it's lighter than is predecessor. It has an enormous capacity of 190 liter that allow to load all the gear, from wings with competition harnesses up to full tandem equipment without any worry. 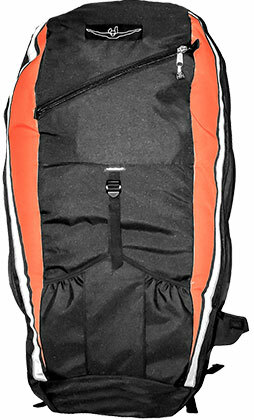 The backpack is closed with two side zippers and the top hood is removed to make the packing more solid and ergonomic. Elastic side pocket allows a quick access to a bottle of water or a mobile phone. > Three compression straps plus a belt strap ultra-strong for reducing volume and improve the solidarity with the carrier. > External mesh stuff pockets for quick access to tools. 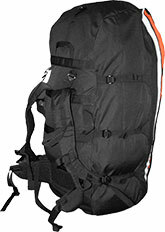 > Padded back and shoulder for carrying big loads without effort and with adjustable height and chest lock. > Waist belt padded for extra comfort walking with the weight moved above the hips. > Attractive design, well balanced and resistant to dust and dirt. > Cordura high tenacity very resistant to wearing away and polyamide in the less critical areas to save weight and improve air transfers. > Super strong YKK zippers and straps with top quality locks secures everything. All this together make the new bag impossible to brake.